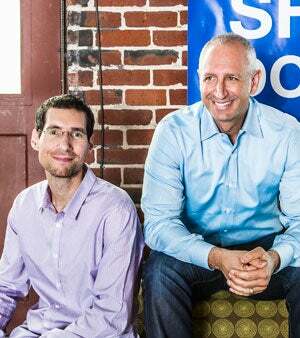 Easy money: Crushpath founders Matt Wilkinson (left) and Sam Lawrence. Matt Knapp knows sales, and he knows the value of high-quality CRM software. But the pricey program he was running kept eating more and more of his bottom line. His six-person sales team at Lincoln, Neb.-based Facts Management, which sells tuition processing tools to private K-12 schools throughout the U.S., needed something less expensive. So Knapp, senior vice president of key accounts, gave the new web-based sales tool Crushpath a try. On the surface, the app created by San Francisco-based Crushpath seemed almost too simple when compared to the complex sales software Knapp used previously. The Crushpath platform allows just about anybody, including part-time salespeople and jack-of-all-trades solopreneurs, to create in a matter of minutes one-page websites (called "pitch sites") that target specific prospects with special deals. Each pitch site has a unique URL, so it can be shared easily via e-mail or social media, or indexed on the web to capture leads through organic search. "I loved the idea of a deal site that I could customize quickly," Knapp says. "We have a very defined niche market, but our customers can still vary greatly between a 250-kid church school to a high-end boarding school." And it works. Knapp points to a pitch site that generated more than 900 views and a face-to-face sales call. For Crushpath co-founder and CEO Sam Lawrence, that's what his company is all about. "One thing was clear when we started: CRM needed a root canal," he says. "Crushpath was built to be a very simple solution to allow anybody to sell, not just full-time salespeople." Lawrence and his partners, veterans from the software industry, conceived Crushpath as a way to connect social media feeds and Salesforce software into one convenient package. That model landed them an initial $2 million in seed funding by June 2012. Since then, growth has been driven by their development of the pitch-site model, now used by roughly 30,000 entrepreneurs and small businesses, as well as giants such as Frontier Airlines and Farmers Insurance. The appeal is ease of use and value: Crushpath offers a free license and a $9 per-month per-user license, vs. the $25 or more per month charged by Salesforce.com. That revenue stream helped score Crushpath a $6 million Series A round in March, led by George Zachary of Charles River Ventures and Chamath Palihapitiya of The Social+Capital Partnership. Palihapitiya, a seasoned VC and one of the original senior executives at Facebook, sees parallels between Crushpath and the social-networking giant, which itself started with the basics and built out features slowly. "The tip of the spear for Facebook was the user profile," he says. "The tip of the spear for Crushpath is the [pitch] site."